Say hello to the newest cart to the SC Carts family & blog – the Lumsden Limo! 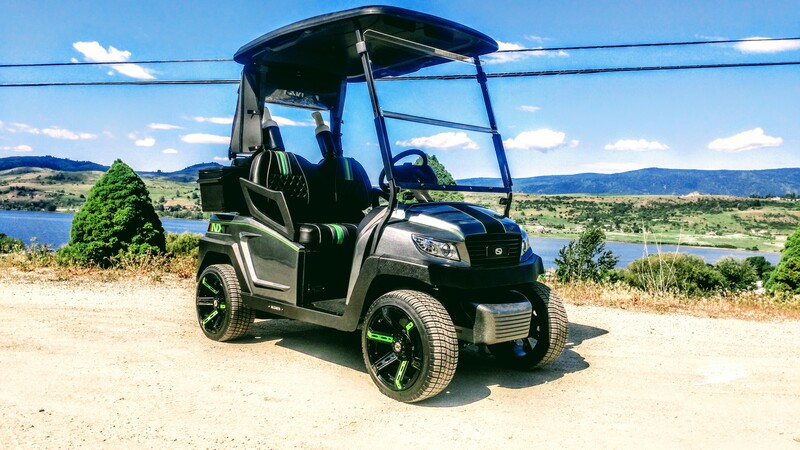 This cart is all kinds of gorgeous and we can’t wait to show it off, it is sure to turn heads at Predator Ridge! We start in the paint booth with our NXT body panels. Next we laid down the sealer and then painted the grill black. With the sealer dry this 3 stage custom paint job was ready for the white base coat, this is what will give the green the look we are after! We love how bold this crazy cool color is! Check it out with the black grill! Now it’s magic time! Custom mixed House of Kolor flake! After several coats of clear, here is the result! This paint job literally looks electric! With our NXT’s we designed the battery area to accept 6 8 volts or 8 6 volts for extreme range. Golf applications don’t require the extreme range option so we designed a custom under seat storage tray to make use of this space. This gives a bunch of extra useful area under the seat and could also double as a cooler as the water will drain out. With the paint dry we assembled the front cowl and installed it! The front roof supports and windshield went on next! Starting in on some of our custom badging with our SC Carts rocker plates. Our customers requested a cool feature on their cart, they want a lockable trunk. Here we laid out the initial design in cardboard to get the proper fit. Next we will input the design into computer and cut it out on our CNC machine, then we can form it in one piece! How about these custom seats, our upholstery department nailed this look! This cart is going to be a show stopper with it’s one of a kind look! Come back next week when we get a bunch more of the finishing touches completed on this super cool buggy! ← Fresh Year, Fresh Website!